Known for its fine regional cuisine, this Richmond farmhouse delivers native Vermont fare with white linen service. 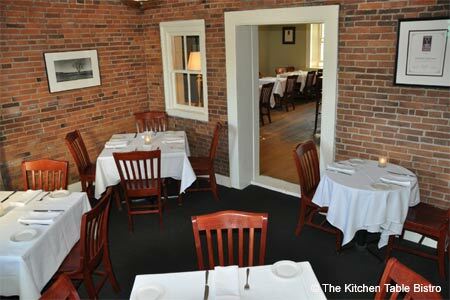 : Just off Interstate 89 in the bucolic town of Richmond sits a quaint, 200-year-old brick farmhouse, and one of Chittenden County's coveted kitchens. Owners Steve and Lara Atkins honed their craft in Napa Valley before coming to Vermont. The bistro's B&B décor is equal measures white linen and rural comfort, with hardwood floors and generous spaces between tables. Guests are greeted warmly, and then treated to crunchy sourdough loaves with dishes of freshly churned butter. From a wine cellar that boasts scores of worthy bottles, we recommend Cakebread's Sauvignon Blanc --- a bright Napa starter that refreshes like a summer dip. Don't miss the Vermont steak tartare with quail egg, pickles, radishes and crispy potatoes or the standout lobster parsnip soup that teases palates with a hint of nutmeg. “Large plates” include favorites like roasted pork shoulder and butternut squash risotto. There’s almond, orange and hazelnut butter cake for dessert. Service is unhurried, so plan on making a night of it.